It only makes sense to start talking about gemstones by picking the one I love the most (for still unknown reasons!) - turquoise. Inside the 'middle pack' we will find 'my' stone - turquoise. With its green-blue colour, turquoise is right in between the 2 spectrum of colours: warm and cold. Thus - it is a balance stone - it helps us to understand ourselves better and bring our emotions under control. The Native Americans hold it as a sacred stone, one that absorbs negativity and transforms it in positive energy. Their belief is turquoise will help you become one with the Nature and Universe. For healing properties - apparently it is useful for people with respiratory problems (throat, lungs, asthma)... and that might be very well why I am so drawn to it! Some of the turquoise meanings include: protection, meditation energy, wisdom, balance, honest communication, strength, friendship and love. Turquoise is considered to be generally healing and bringing the wearer positive thinking and sensitivity. Turquoise gemstone connects us with all life. Also enhances friendship, love, communication and loyalty. It is the birthstone of people born in December (or under Sagittarius sign) and the 11th Anniversary stone. By now you know I am fascinated by nature - I truly believe we have more to learn from watching natural world around us, and we seldom do it properly. So when I come across a miracle moment like this, I feel compelled to share it: jaw-dropping footage of amazing sea creatures and their underwater world. Today we explore a very small part of the surprises: Enjoy! If you're not an architect or have some serious interest in architecture I suspect you didn't know what google's image today was for... I, for one, was wondering if my son's social studies latest project is somewhat related (they're building a city with geometrical shapes - in the process learning a lot about shapes and communities!). Then I remembered, as soon as I read his name - you see, I had a wonderful friend, architect and when he was talking I thought I am not listening... but I did, at least some :) One thing is for sure: next time I'm in Toronto I am going to pay more attention to the TD Centre, a building Mies vand der Rohe designed... many eons ago... with a flare for how the future will look like. Bonnie had a wonderful idea: to challenge us to making a jewelry piece in the Pantone colour of 2012: Tangerine. You can see all the cheerful design in her Tangerine galery. Jasper's Gems: Tangerine Tango Reveal: A few weeks back, I sent out a challenge to jewelry designers to create a piece featuring the Pantone colour of the year, Tangerine Tango. 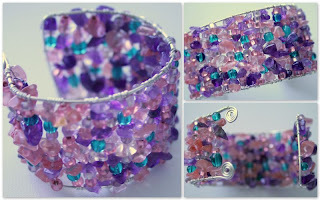 Since these challenges are a great way to make me to stay on track (I am sure you know how life interrupts your most peaceful jewelry making moment) I entered another one: Erin's Spring challenge (from Erin's Jewelry Creations, you can read all about it on her Facebook page, right here). your piece(s) must have the colors Pink, Green and Purple in them(that's the challenge part) .. add other colors if you have them. reveal date is March 25th (today :)). Those 3 colours are no challenge for me - I love them separate and the mix spells Spring for me! 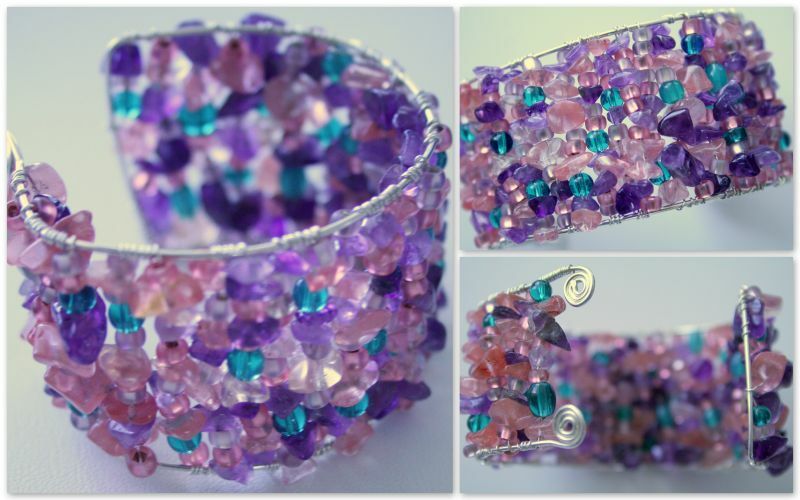 I decided to make the challenge about a new piece I've been thinking to make for a few months now: a cuff bracelet. I don't know why I didn't try it... mostly for fear of failing, probably... but now I said to myself: "excuses begone... you *are* making one... doesn't matter what the end result is!" figure out how to make it non-stripy... I don't like the 'stripes' at all - the end result is not bad, but in a more chaotic display will be more pleasant (for me, at least). She packed it well - smaller packages inside - lots of small ornamental boxes... you open the lid and a new treasure comes to live! Lots of vintage jewelry - pieces and bits, broken strands, miss-matched earrings; but also adorable colours and beads, lovely old earrings (really old). We kept opening box after box in awe (my son and I) - he kept asking 'is this how things are done in Romania?' and I kept telling him everything he sees is over 30 years old (there are pieces over 50 years old), some were mommy's, some were grandma's, some were great-grandma's and some might be even older. She sent one of my own wood construction set - and he reverentially touched it... I asked him to build something and he asked "aren't you afraid it will break?" He took it like a museum piece :) Then he cautiously started to play with it and the look on his face was quite precious. Big buttons and small buttons, colourful buttons and neutral buttons, simple textured buttons and beautifully textured buttons. 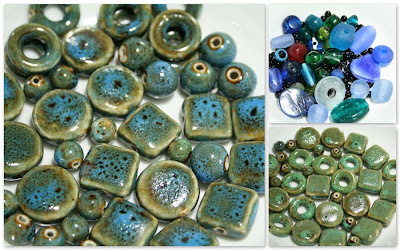 Buttons without their pairs, enameled or with a small beautiful bead. This is the treasure my mom sent us - a personal and full of memories treasure! Last 2 weeks we have talked about Birthday stones and their meanings (January to June and July to December). This is a blog about beauty - not necessarily shallow or surface beauty, but beauty nonetheless. I have always been drawn to pretty things (hence the name of my blog and studio), I just feel better when my table and my room is full of lovely things (even when they are scattered in what people call 'chaos'). I always knew that beauty makes you happier - or that the lack of beauty will make you unhappy, to be precise. And now... I discovered a lady who's trying to scientifically prove just that! To quote from her TED profile: "Nancy Etcoff is part of a new vanguard of cognitive researchers asking: What makes us happy? Why do we like beautiful things? And how on earth did we evolve that way? Her recent research into the question of happiness exposes results that not only are surprising but reinforce things we should've known all along: like the fact that having flowers in the house really does make us happier." "The formula for a happy marriage is five positive remarks, or interactions, for every one negative." Spring seems to have sprung around here: in 15 years of Canada I do not recall any year with this kind of winter, and this kind of Spring! Are you kidding me? 24 degrees? In March?! March was the barely-over-zero-and-when-you-hit-5-plus-consider-yourself-lucky month. So what do you think this girl does when she comes from work and it's 21 (Celsius) outside and all sunny and bright? First she asks her son to get out somewhere - but the boy is exhausted after the first day of school and doesn't want to go hiking, biking, or playing in the park. But he wants to go out - so he suggests 'backyard!'. Backyard it is - I first gathered a couple of books, but when I got out there... I ended up cleaning the shed (just don't let my hubby know the state of the grass, please, I threw everything we need to get rid of right in the middle of the yard :)). Right when I was done - I found some bulbs that started to sprout, so we decided to plant them... moved in the front yard... planted a couple... and we discovered we need to uncover the yard, it's burried under sticks (from all the windy storms of the winter) and debris. No problem - got myself the rake, I start raking... and here is where it gets funny. * Great - what do you want to do? A few good minutes passed by until he triumphantly comes back with the rake and... a broom. * OK... ooohhh... a ladybug!!! Rake gets promptly dropped, the kid is on his fours, admiring the ladybug... a few moments later he brings it to me and chats away about it... a few more minutes later he decides to put the ladybug on the tulip leaves. In the meantime I am raking away, and I am at the end of the driveway. The kid drops the broom, and he gets down (laying on the driveway) to study the ants now. * I wish I could feed them. * I wish I could take a piece of cheese and see if they brake it smaller and eat it. But he honestly wants to help me clean - we argue about not having time to do it tonight and he's almost crying... I hope we keep this nice weather for a few more days! Oh, boy - am I excited or what? Lo on behold what do I find?! A bag full of ceramic beads. At first I thought there might be one or two... but no... it is a bag (the size of a sandwich bag) filled with mostly ceramic beads and a few glass beads too. Of course I snitched it! At home, after cleaning them well - I spilled them on a towel to dry out... and my surprise became even bigger (if that's possible): inside the bag were not one, but two full sets of ceramic beads: one a light green, one a beautiful turquoise. Round beads, disk beads, square beads, round beads (smaller), and ring beads... a kid in the candy store I am now. But this week I am busy with the small challenge Erin (from Erin's Jewelry Creations) concocted last week (you can read all about it on her Facebook page, right here) and until I am done with this new technique I've tried, I am not starting anything else... no matter how tempting that might be! A women came to ask for advice from a wise monk. - Father, I always have words with my husband, can't make him understand how to do the right thing. - What do you do when this happens? - Well, I quarrel with him, of course. - And the next time when you had issues - what did you do? - Same thing: I quarrel and we reproach. Next the monk took a bundle of keys, gave one to the woman and asked her to unlock the door in front of them. The woman took the key, tried it, and when it didn't unlock the door, she asked the monk for another key. - Maybe you didn't know how to use it, try again! But no matter how much the woman tried, the door will not unlock. - Father, give me the whole bundle of keys and I will find the right one, she said. - See, my daughter, if you cannot open this door with a non-matching key, how do you expect to open your husband's soul door without the proper key? Find the right key, and you'll be able to open the door! A gracious and simple answer, one we so often ignore! We just need to find *the* key, that's all. For a long time now I've had a fascination with Celts and their rich history and legends. I have good friends - Scottish and Irish - and I asked them how come their music and stories are more on the sad side, at least more than in other cultures. One of them remarked that a sad story or song "will move the spirit" and I had to agree with him, it seems the best works of art have been born out of sad moments. Their music and their voices are very special, the tones of their fiddles are unique and easily recognizable and who can keep still when one of their dancing songs is played? Oh, and the dancing... dear Lord... I'd be hard pressed to find something more beautiful than a Celtic dance. I like their stories a lot: not only because they are full of spirituality and magic, but also because they seem to be the only people who understand that life cannot be painted black or white. A Celtic story won't finish 'well' (or perfectly well); a good fairy is not perfectly good, she can be nasty if you anger her; a badly behaved leprechaun won't be totally bad, he might help someone in need. Everything seems to have the possibility to be or become good - which is (in my opinion) better than the well-known 'happily ever after' ending. They are not afraid to dwell into what happened after all the other stories will end happily. And the morale of the story seems to always be "yes, there is fate, however - it's in your powers to change your fate, all you need is the will". And then... there are their wishes and curses. I never know where one ends and the other starts - I've read wishes you wouldn't wish to your worst enemies :) Again this mating of the good and bad, the black and white. May the fleas of a thousand camels infest the armpit of your enemies and may their arms be too short to scratch. P.S. The translation of the title: May you have a thousand good things! 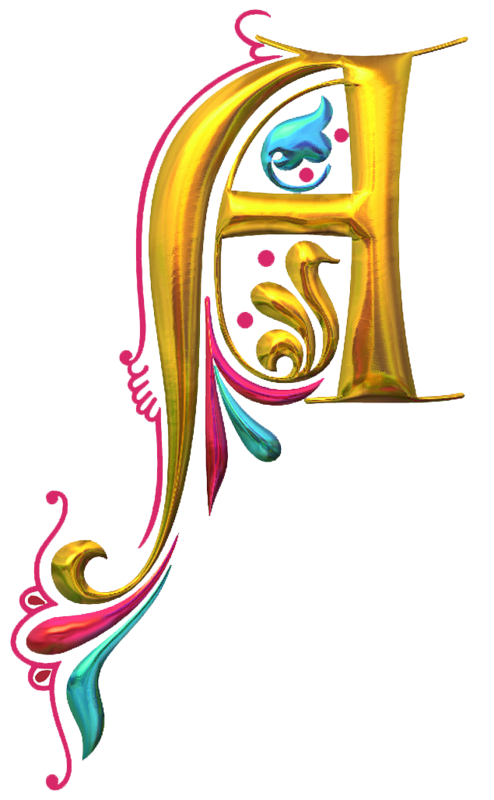 A few weeks ago I stumbled upon a great site Marc and Angel Hack Life. It is one filled with inspirational quotes, but in a very tasteful way (I am weary of tasteless and aggressive marketing of anything). 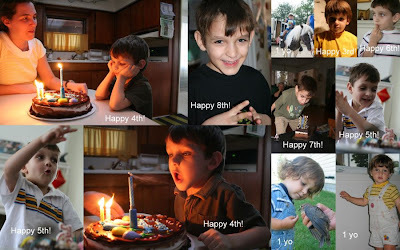 Yesterday, I believe, they ran a splendid photo-journey: 25 Photo Illustrated Reminders to Help You Find Happiness. These are simple steps we can all take, one at a time, to make ourselves happy. I am a firm believer in the idea that happiness is inside oneself, all we have to do is reach and grab. Yes, context matters and bad things happen - however, happiness is about how you react to what happen to you. There are many ways to respond to the context and very few people will choose to be positive and try to make the best out of it. Although it's in our power! May you find the power to be happy! 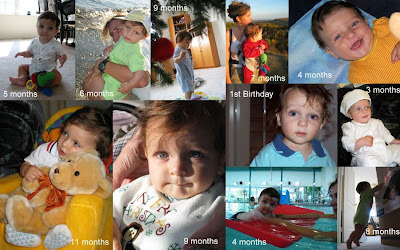 Last week we talked about Birthstones - January to June. Today we will continue with the second half of the year. July is associated with Ruby - with a meaning of... well, it's red, what do you think? yes, love and friendship. It is considered one of the most powerful gems bringing the bearer peace and confidence, health, as well as courage. 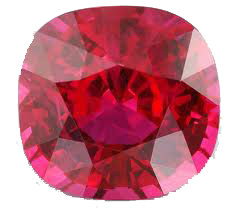 Ruby is thought to protect its bearer from misfortune, and to bring him/her good luck and power (especially when it is worn on the left side - could it be a link to the heart?). It is a symbol of royalty. August is associated with Peridots - with a meaning of purity and beauty. 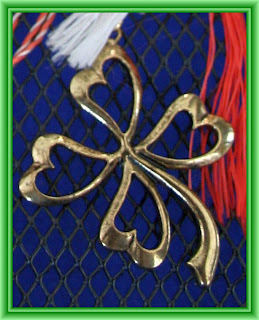 It is considered the stone of friendship and brings joy and happiness. 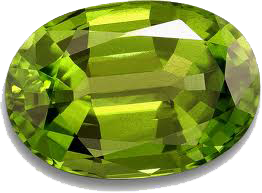 Pirates used peridot as an amulet against evil. Peridot is said to bring you luck and success, ease your sleep and have a calming effect on emotions. September is associated with Sapphire - with a meaning of truth, sincerity and faithfulness. 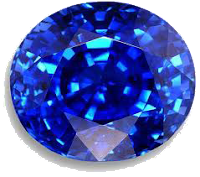 One of the four gemstones, sapphire can come in a variety of colours, except red, but it's mostly known in the deep blue shade (who will ever forget Princes Di's ring - now on the finger of the Duchess of Cambridge). Sapphire has been always considered a sacred gem (the legend has it that Moses brought the 10 commandments written on a Sapphire tablet). It is considered the stone of clear thinking and clarity. 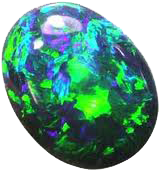 October is associated with Opal - with a meaning of hope and happiness. Opal clarify by amplifying and mirroring feelings. It is believed to bring inner confidence to the bearer. November is associated with Topaz - with a meaning of courage and wisdom. 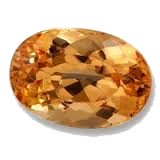 Topaz is believed to bring mental clarity, focus, perception, and confidence. Combined with tiger eye, topaz will bring wealth and money. December is associated with Turquoise - with a meaning of success and prosperity. One of the oldest stones known to man, turquoise and associated with the blue sky and the green earth, turquoise is a symbol of wisdom and mankind's source (spirit / sky). Turquoise has healing properties and brings you courage, friendship and luck. This stone is a very personal and meaningful stone to one who wears it, and it takes on the characteristics of the owner. The fascination I have with turquoise - you'd think I am born in December :) And to think that I never evern owned my own birthstone (Emerald)... it doesn't seem a gem too common! 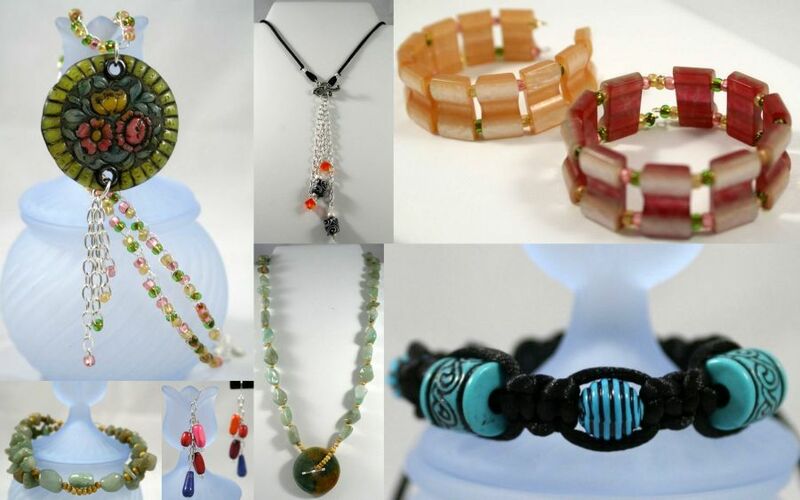 These are the gemstones and semi-precious stones associated to one's birth. If you want to make a very personal gift to someone - use their birthstone: in jewelry for women, in cuffs and links for a man. What is your relationship with your birthstone? A beautiful short video on flowers - in ways you might not have thought about them before! Congratulations to Tapping Flamingo! She won a Shambhala bracelet or an Angel drop. Voila - it doesn't have a name yet (other than 'Adventures in teal and turquoise', of course) but it's beautiful, if I can say so myself! A man had a swamp on his land. Because of it - his crops will never grow. He tried and tried to dry it off, taking the water out in a bucket, but with no results. - If you want to dry off the water, you need to cut off its springs (sources). The man listened to his advice, cut off the springs and he grew up the most wonderful crops! This is how you need to solve your problems (the swamps of your life): not by patching the result, but by cutting off their sources! Can you believe it: I still have a few participants to go through... But I had a crazy week, I could barely breathe (and my DH, God bless him, started to get impatient with me for so long on the computer :)). You can read about the results and my struggles with the soup here - my challenge was the variety of media used: from gunmetal to sterling silver, from jade to polymer clay, I had a few beads of everything and I was quite stumped! Loved every piece - but still - stumped. I put everything in a bowl and had it on my desk for a while: that seems to work, since in the end I used everything except 2 beads, 2 bead caps, and the heart toggle! You can hop to see what other participants had made - I have never seen so much beauty amassed in one place! It is like a One-of-a-kind-show in blogs! There are no 2 styles alike, no 2 pieces alike - and they are all (and I mean all) gorgeous! I fully expected to encounter pieces I wouldn't wear and some I wouldn't like, they wouldn't be my style: after all, it's hard to like everything, as hard as it is to please everybody. Boy, have a I been given a surprise and the chance of a lifetime! 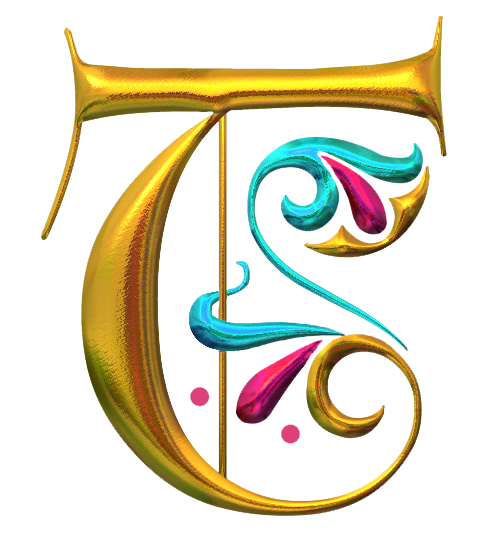 Yes, some styles are eons away from mine, but I really, really, really loved and liked each and every one (the few blogs I haven't posted yet - it's because I could not for some strange reason!). I found this amazing! 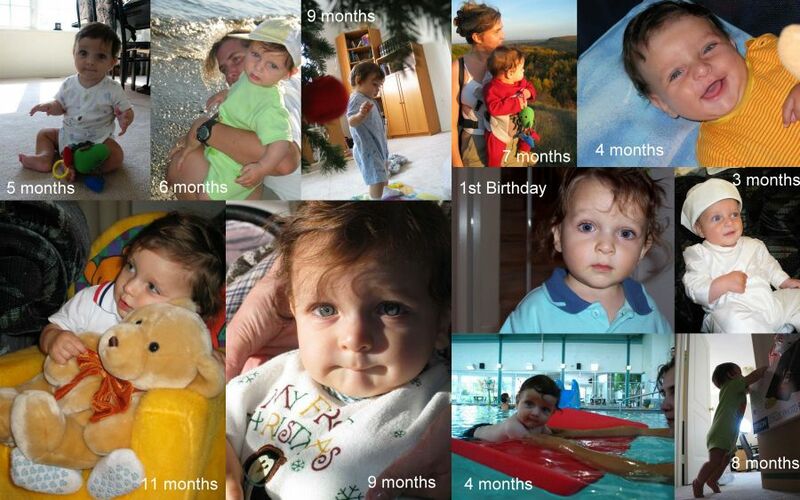 This was my journey - and I will repeat it in a jiffy, given the opportunity. Thank you again to Lori, our amazing hostess - and hopefully you'll join me through my future adventures. Until then: keep safe, keep beauty in your life, and keep healthy! 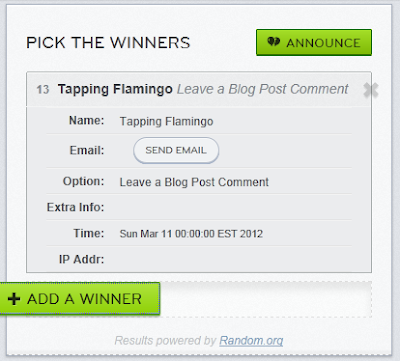 Oh - and try to keep lucky too: have you entered the Giveaway? A Shambala bracelet will go to a lucky person, check it out! 'Pictures of butterflies' and 'Pearl necklace with silver crochet wire and copper beads' (that was a mouthful!) were neck-in-neck next. I get it: I talk about butterflies a lot, I pictured them too (at least one post I can recall, here) and same about pearls, silver, crochet wire (no copper beads yet, maybe in the future). Do you have a blog? Did you get strange query phrases? What's the strangest you've encountered? In our 'how to...' series - today about birthstones. The moment of birth is being held in all cultures as an important one (it only makes sense :)) - since ancient times mankind has associated various symbols with the birthday: zodiacs, colours, numbers, even a precious stone. Each month has its own symbols and meanings - and it is believed that you'll benefit the most from the powers of your birthstone if you wear it during your month of birth. January is associated with Garnet - symbolizing prosperity and health. It is thought that garnet will bring success in business, as well as friendship, and protection on trips. 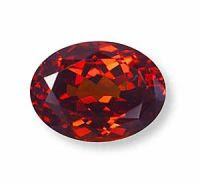 Garnet is a mineral, mostly know for its deep red (although it can be found in many other hues: yellow, violet, orange). 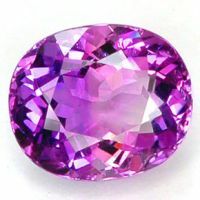 February is associated with Amethyst - with a meaning of wisdom and security. Amethyst, with its beautiful purple shade, is believed to protect against negative energies, bring pleasant dreams, and help in meditation. 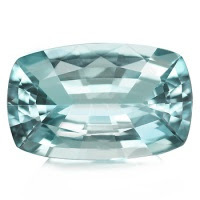 March is associated with Aquamarine - with a meaning of loyalty and happiness. Due probably to its beautiful shades it is thought to protect the sailors and the travelers by water. 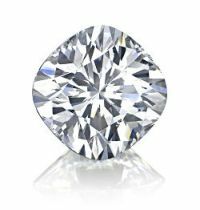 April is associated with no other gem than Diamond - its meaning being eternal love (hence its wide usage as an engagement stone in recent times). The name comes from the Greek 'adamas' and means 'undistructable' (since diamonds cannot be cut by any other stone), which suggest the eternity of true love. Diamond is one of the only 4 precious gems: diamond, emerald, ruby, and sapphire. All others are semi-precious stones. May is associated with Emeralds - with a meaning of patience and understanding. 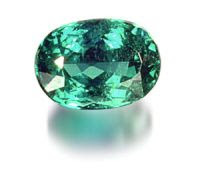 Long being held as a symbol of hope, emerald is considered a stone of prophecy, bringing the wearer reason and wisdom. June is associated with Pearl / Moonstone - with a meaning of purity and happiness. The pearl is the only organic gemstone (coming from a living organism: the oyster) and there are many legends associated with it. In one of them - a drop of rain fell from Heaven becoming the hearth of an oyster, and giving birth to the first pearl. 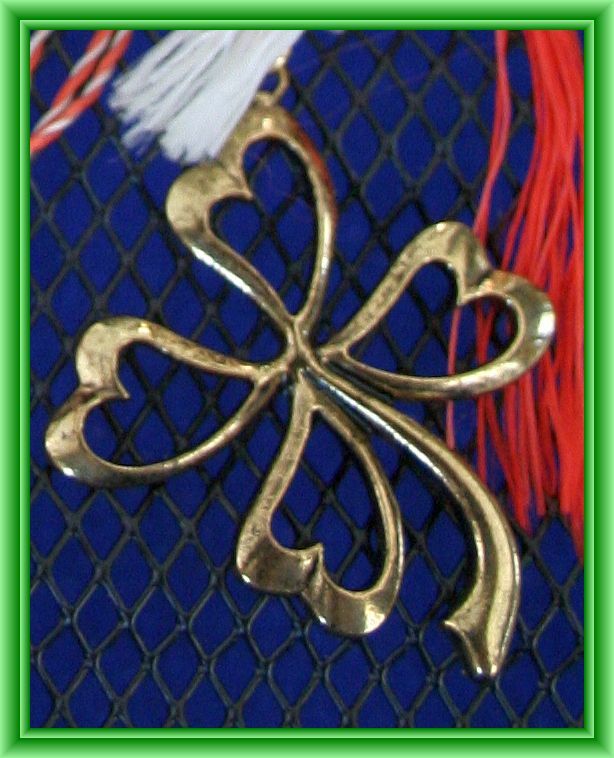 Symbolizing purity and innocence it is widely used in bridal accessories or embroidery. Come read us next week - for the remaining 6 months and their birthstones. With St. Patrick's Day right around the corner - it seems appropriate to share a beautiful song in a beautiful interpretation. I love Natalie MacMaster to pieces - she's such a wonderful artist (plus she's Canadian :)) And I love Celtic traditions - something draws my soul to their stories and legends and traditions. So here you have it: a Celtic song in a Celtic interpretation! Enjoy! All that your heart might desire. A gorgeous day today (albeit cold! ): sunny with that glass-blue sky. Today is my 'baba'... how am I going to explain this tradition?! I know - Wikipedia to the rescue: The Legend of Baba Dochia. As you can see (at the very end of the article) - there is a custom associated with this legend: women will pick a day between March 1st and 9th to be 'their baba' and watch how the day turns: if it's nice, they'll be nice when getting older, if not... well, you get the idea :) Back in Romania beginning of March will be spring already, so you'll have a 'chance' at being nice when growing older... here - well, if you count just the temperature, you're toast :) So I go by the actual weather, ignoring the temperature: judging by how gorgeous this days is, I'll be a very nice old lady... lol. With that in mind - today I am going to talk about a beautiful necklace I made long time ago: it is one of the first wire crochet necklaces I put together, using glass pearls in a gorgeous mint green and white. When you add the sterling silver brightness to the match you end up with a very happy necklace. I love wearing it - it is light and comfortable and it reminds me of spring. I love wearing it in winter, makes the winter blues go away. When I designed it, I wasn't sure how everything will come together - I knew the minty pearls will be cheerful and joyful, but when I finished it I had a huge smile on my face: it is an incredible happy piece. Besides being happy, it is extremely versatile: the pearls make it look wonderful with jeans or with a beach dress, with a business attire or with an evening dress - and it is a perfect additions to a bride's dress! I knew from the start what to do with the Jade focal... I also knew I had no jade in the house - so I made a trip to the store... just to come back home and find a vintage strand of jade, from my mom. It is somewhere in the vicinity of 40 years old and it matches the doughnut to perfection! I also found some amazing Czech glass 6/0 seed beads that imitate stone. Out of my mom's strand there were some stones left, so I made a slightly asymmetric bracelet. The only thing I'm not happy with is the half toggle I used (it's sterling silver... I will replace it with a gold plated / filled as soon as I find one :)). The polymer clay focal was a pretty easy one - matching the pastel colours was fun albeit a lengthy process... many a bags I have picked until I was happy with the result. I also knew what I wanted to do with it... at least half-way... Sterling silver wire crocheted with the beads, a few cute beads on the drop and here we are. 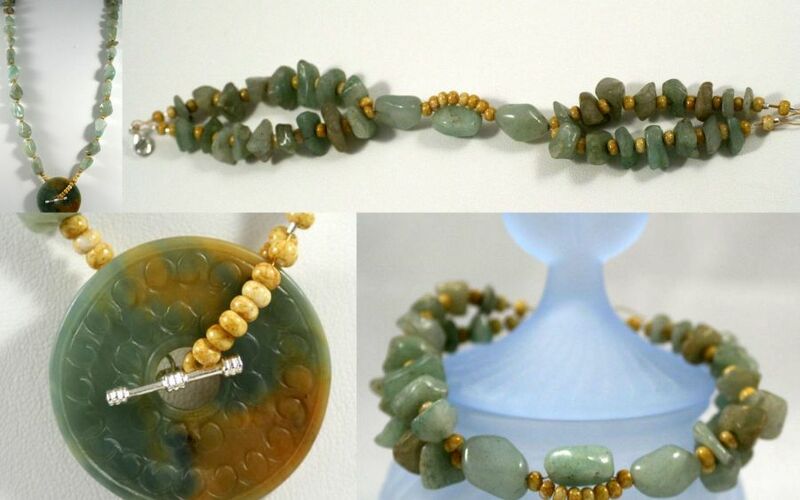 As luck or fate would have it - when I found the vintage jade strand I also discovered a couple of vintage bracelets made of raisin... amazingly enough in the exact same shades as the focal flowers and the Czech beads. When this happens all you have to do is to return the favour and make something out of them. And that's what I did: 2 bracelets using the double-whole pieces from my bracelets (which I wore many, many years ago until their string broke) and some co-ordinating Czech beads to bring the set together. I am not 100% happy with the necklace (I keep thinking triple strand braided together for more 'volume'); even asked my son about it - he was adamant it doesn't need the multiple braided strands, to quote him exactly "The simplicity of the design makes it nice" - there you have it, the wisdom of an almost 9 yo! 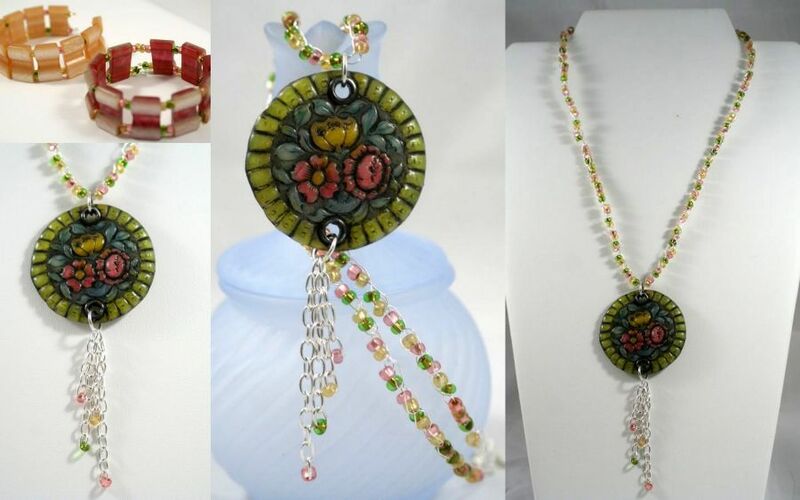 You really have to see them together to appreciate how beautifully they match - 3 different ingredients (the focal, the Czech beads, and the bracelet 'squares'), from completely different materials and from different times. I just love the whole set! So far I used both focals - but none of the clasps yet... hmm... both were too beautiful to be hidden at the back of the necklace; none would match the jade necklace (and I wasn't sure if using just half is acceptable)... What to do, what to do? 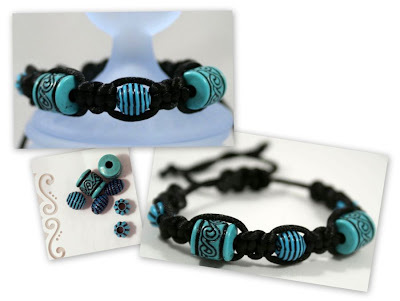 While making my Valentine's Day set (you can read about it right here) it just hit me - the Krobo beads! 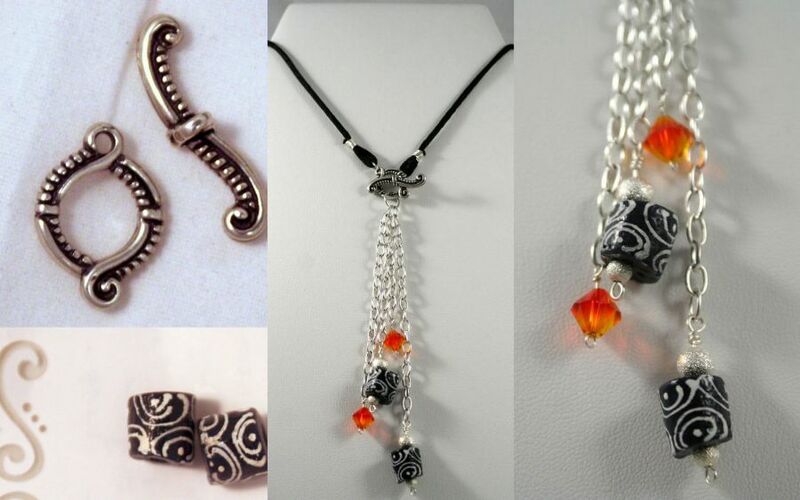 After searching a bit - I found everything I needed: the beautiful sterling silver toggle clasp, a silk cord, some silver wire, a couple of fiery Swarovski crystals, chain, and some head pins. Just don't ask how many times I wrapped that silk cord before I was happy with the result :) I just love this necklace - it is so simple and yet so powerful! The cutest pair of earrings I've ever owned! A new trip to the store is needed soon - I intend to find matching beads to make a bracelet or a necklace (or both if I know myself). Believe it or not, I still have a few elements of my original soup! Thank you, Dita, for being so generous. Thank you, Lori, for allowing me to be part of this party - it has been the best jewelry-related adventure so far. I had tons of fun with my ingredients, and I am quite pleased with the results.